Clear Channel Outdoors (s cco) today announced a free Android (s goog) version of its FLYsmart mobile application, built by Geodelic Systems, that combines flight-tracking functions with detailed airport maps and user location. 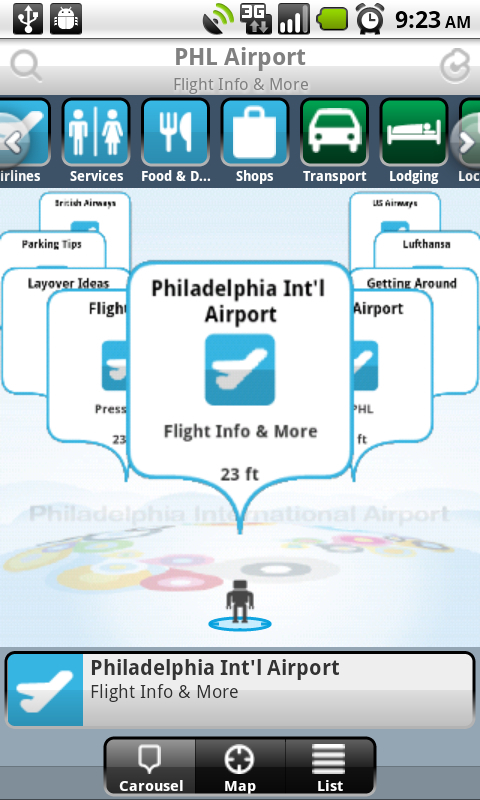 Currently, FLYsmart offers maps for 20 airports, but intends to add more facilities on a frequent basis. In supported airports, FLYsmart’s maps include gate locations, ATMs, newsstands, restaurants, gift shops, clubhouses, restrooms and other amenities. As a regular traveler, I rely on smartphone apps to manage my flight arrangements, schedule and such. Over the past few years, I’ve used TripIt for this purpose, which has long been available on the major smartphone platforms. It’s unlikely I’ll switch from TripIt to FLYsmart because the latter doesn’t include scheduling features, but it does represent the opportunity for future location-based service (LBS) apps. There are a number of LBS apps I could use in an airport to find the nearest Starbucks (s sbux), rest room or ATM. Point Inside is one we covered earlier this year, and it certainly excels at indoor navigation. While apps like this provide value, they’re often “one-hit wonders” that focus solely on navigation. To do anything else in the context of airport travel, for example, one has to leave the navigation app. By adding real-time LBS functionality to an app with other specific base features, users will ditch navigation-only apps in favor of multi-purpose app for a given context. Earlier this year, Om suggested that 2010 could become the “year of location.” From the point of view of checking in to venues and finding nearby friends, photos or Twitter pals, I agree that location definitely became more mainstream this year. But if I were a developer, I’d be looking beyond 2010 and past the more basic applications of navigation and check-in. Instead, I’d bet the future on adding location to platforms and current apps where location is a logical value-add, not a solution in and of itself. With ABI Research recently estimating $1.8 billion for location-based mobile ad campaigns in 2015, I’d want to offer the location-based apps that do more than just basic location. Yes, I do agree with Kevin that the adding LBS to business-centric applications is the right way to go, rather than having isolated applications focused on on-site navigation. I currently work with Absysseo (www.absysseo.com), a french startup witch provides the SmartInDoor library allowing to instantly include LBS functions to any mobile application, whatever the target platforms is (Android, Iphone, Windows…). We receive great market feedbacks and interest in various application areas : airports, shopping malls, museums, industrial sites, etc. It seems that LBS software components is really the better route for application developers. Check http://www.absysseo.com/en_index.php for more information. Kevin, good point about the feature vs value and benefit of location. We at Coloci.com couldn’t agree more. Coloci helps you share your future location/activities with your social network, enabling you to meet up with them when they are nearby. Meeting face to face is under-appreciated in this era of e-connects. For the socially active: helps you strengthen and expand your network. For the super busy: efficient networking, by helping squeeze in relevant meet-ups, it reduces the social noise. For the frequent traveler: enables you to meet all those friends who you had no idea were near your destinations. I’m surprised you haven’t covered the location-based platform plays like http://geotoko.com and Placepop. There’s some awesome value prop for those apps.